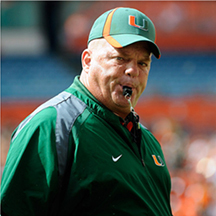 Coach Arthur Francis Kehoe began his tenure at the University of Miami in 1979 when he transferred from Laney Junior College and played guard for two seasons under Coach Howard Schnellenberger. After graduating Kehoe returned to coach at the U and is now going on his 28th year at the university. He is widely recognized by fans and loved by his players for his animated personality and uncanny ability to motivate those around him. There is no question where Coach Kehoe is at any given time around his team as he will be heard ranting phrases such as, there is too much milling around, and miles to go before we sleep! At Miami, Art has produced seven 1st Team All-Americans, an Outland Trophy winner and a Rimington Award winner. More than 20 of his players have gone on to the NFL. He has been on staff for all five national championships, two Heisman Trophy winners and seven of Miami’s nine 1000 yard rushers have run behind Kehoe’s units.